One single head of India Mustard (tastes like a spicy lettuce) that was harvested from a Portable Farms® Aquaponics System. In sunlight, plans use photosynthesis to turn CO2 and water into oxygen and sugar. In the dark, plants switch to the same system animals use to stay alive, the building and repair of the organism itself. Added to this phenomena of growth, is the fact that as the temperature increases, chemical activity speeds up. The closer to the ‘ideal’ temperature the better for the plants to grow. The ideal temperature for plant growth is, interestingly, 73° F at the leaf surface or about the same temperature as humans enjoy. In a climatically adapted greenhouse, temperatures are regulated so the maximum temperature the plants can comfortably tolerate is never reached and the lowest temperature that the particular plant can grow at, produce the best possible conditions for growth. To have a warm garden in the winter time takes some planning but once it is in place, it will produce prodigious amounts of happy food. For a plant to have all of the nutrients and water it can possibly use delivered to its roots before it even needs them means the plant can grow a quickly as possible because there are no limiting factors. 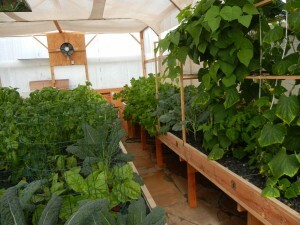 The water in the Portable Farms® Aquaponics Systems turns over ENTIRELY twice a day. Plus, all of the heavy fish poop has been removed and rerouted so it never flows into the Grow Tray or has contact with the plants. One of the (many) key reasons plants in Portable Farms® grow so quickly and so LARGE is because the plants roots are bathed in warm water that is loaded with nutrients and are supported by warm gravel in a warm building. What more could they possibly want or need? 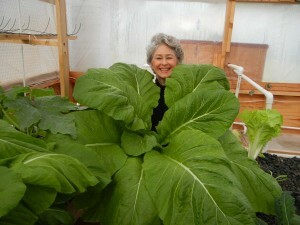 Portable Farms® spoil the plants and and cater to their every need for comfort. 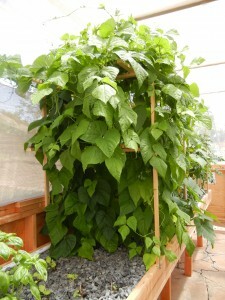 Interior of a Portable Farms Aquaponics System. Start the process of having your warm garden by taking the Aquaponics University Aquaponics Online Course today and have warm healthy and delicious plants in only a few weeks.